When a historical fantasy grips you from the very first page, you know you are in for an excellent read. 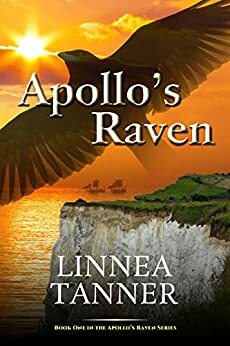 With Apollo’s Raven by Linnea Tanner, we are brought into the world of the not-so-distant past when Rome set their sights on Britannia. We follow the experience of our protagonist Celtic princess Catrin and her star-crossed Roman lover, Marcellus. On opposing sides of a battle that grows fiercer with every passing day. There is more to this tale than love and war for magic and mysticism are part of the lifeblood of our characters. This is more than a tale of might and magic. This is also a tale of a woman coming into her own as a powerful warrior and a strong mystic. Catrin has faced uncertainty and hardship even within her own family. When pitted against the Roman Empire will she find the strength she needs to survive? When you write a story that has its base in history, research is a must. You cannot simply write whatever you wish and hope that it makes sense. Tanner realizes this and does her best to research her time period. How people acted, how they dressed, their beliefs and their mannerisms are carefully reviewed in this tale. At the end of the book she does acknowledge that the Celts did not leave much written history. This is a blessing for a writer though, because it leaves an open creative license. Since they didn’t keep records, who is to say that the druids did not behave in exactly the same way they did in this book? This is where the fantasy aspect comes in. Tanner is careful not to get too carried away and the tale feels believable and relatable. Tanner begins each chapter with a brief excerpt. This gives the reader a sense of where the story is going. This can be a useful tool when you take long gaps between readings. While there is some slightly graphic content, a teenager would find this to be a friendly reminder of what is about to happen and can help jog the memory if they haven’t picked up the book in some time. The way Tanner portrays women in this book is also very empowering. Our protagonist is a princess, yet she is not fragile. There is no Snow White here. She is forged with fire and metal and trains to be able to reach the pinnacle of fortitude her eldest sister has. For a young woman who is trying to figure out where she belongs in her world, this tale is relatable to other young women in our timeline who are also trying to figure out where they belong. If you’re looking for something entertaining with a fast, action-paced rhythm, Apollo’s Raven by Linnea Tanner is a definite must. The first in a series this book firmly establishes backstory while also being able to stand alone if necessary. It’s a very exciting read and readers of all ages and genders will find something to identify with in this tale. How will things turn out for Catrin? What will happen with her relationship with Marcellus, scion of the Roman Empire sent to oppress her people? You’ll have to read and find out.